I drafted a short post on canned sardines in tomato sauce (ปลากระป๋อง) earlier this year during the time when the city of Bangkok went through one of the most heart-wrenching turmoils in her 228 years. Then I decided against it and, instead, wrote a different post to dedicate to the country and people that I love. This sad little post had since then been sitting in my draft folder, pouting, seething, … forgotten. I can’t even fully recall why I chose to blog about canned sardines. Perhaps it had something to do with the the state of emergency being declared in Bangkok during that time and how my friends and family over there wiped the shelves of their neighborhood 7-11 stores clean in preparation for a Y2K-sized catastrophe. I don’t know. Then last night, I sent out a random tweet casually mentioning that canned sardines in tomato sauce could be doctored up and turned into a pretty amazing sandwich filling. (Without the 140-character constraint, I would have also mentioned that the doctored-up canned sardines could also be be made into a kap khao (literally “[something to eat] with rice”) too. Next thing I knew, 15 direct messages and 4 emails came in within 15 minutes, asking me for more information on this spicy canned sardine sandwich filling. And who am I to say no? Canned sardines in tomato sauce are an Asian, especially Southeast Asian, favorite, judging from its ubiquitous presence in Southeast Asian grocery stores in the US. Having seen it in Hispanic food aisle, I’m thinking it’s well liked in that part of the world too. We love it in Thailand; that’s for sure. One of the most recognizable Thai brands would be Pum-Pui/Smiling Fish brand (ปลากระป๋องปุ้มปุ้ย) featuring on its logo a smiling fish, emitting its trademarked three droplets of drool. It’s been around since I was a kid. Growing up, canned sardines in tomato sauce — both regular and spicy varieties — were the only kind of canned sardines I ever ate. (By the time the Italian sarde salate or French-style sardines à l’huile came along, my heart had already been taken.) Most of the time, we would pour the content of a can into a bowl, heat it up very gently and very briefly, add to it some thinly-sliced fresh bird’s eye chillies and shallots, season it to taste with fresh lime juice and fish sauce, and sprinkle some fresh cilantro leaves on top, if we had any on hand. With just a quick toss, you’d get a very flavorful dish to eat with a plate of warm jasmine rice or plain rice porridge on those perplexing days when the fridge was full but nothing looked appetizing. The same spicy salad, fluffed into flakes with a fork, also makes a pretty good sandwich filling, especially when paired with a crusty bread like ciabatta. Hard to believe, I know. But it’s true. My grandmother would also make a tom yam of canned sardines in tomato sauce. She would pour the content of a can into a small pot and add in just enough water or broth to barely cover the fish along with a bruised-up piece of lemongrass stalk, a couple of kaffir lime leaves, and a few slices of fresh galangal. Fish sauce and fresh lime juice, of course, would be used to season it to taste. She liked to spice it up with dried red pepper flakes. Not a ritzy dish by any means, obviously. But there are times in your life when nothing, nothing, except a big ladle of piping hot canned sardine tom yam poured over a mound of rice would cut it. How do you prepare your canned sardines? True, very true about how these are much loved in SE Asia. Sardine sandwiches (sliced onions, chillies, lime juice + mashed sardines) were a staple party/picnic food when we grew up in Malaysia. And one of my favourite dishes is sardine curry on rice 🙂 Thanks for the warm rush of memories. i love love love canned sardines, the in tomato variety was what i grew up with and only recently started appreciating the in olive oil kind. i actually posted something about it recently. it’s a source of comfort for me when i dig into sardines with rice. That’s the classiest way to eat a tin of sardines! Then she mashed up the offending half-sardine and gave it back to me! same here in the Philippines… we love sardines in all its varieties. Most love them in tomato sauce, but i love the ones manufactured in spanish style (Victorias Brand). the sardines in tomato sauce are eaten as a viand, a cheap, on-the-go kind of food when you don’t need to cook something. it’s healthy and full of uric acid. you just open the can, pour them into a bowl and serve with white rice. instant dinner. It would be more delicious if you pair it up with scrambled eggs and garlic rice. as for the sardines spanish-style, i love making them into sandwich filling. How? open the can… slit their bellies lengthwise and take out their bony spine… mash them… add some calamansi or lemon juice… add some mayo… some black pepper…. sugar to taste… a splash of knorr seasoning or soy sauce… then spread them on top of crackers, inside sandwiches, etc… yumyum… perfect merienda! Juls’ link from the comment above. Thanks, Juls. my fav way of eating the sardines is to quickly saute them with onions ,tomatoes and green chillies.Your salad looks like a yummy idea! I didn’t know sardines were eaten that much in Thailand. I can’t wait to try this. I like to dump a can sardines in olive oil into a bowl of hot brown rice, drizzle with soy sauce and lime juice, and top with peanuts. Or on top of saltine crackers with a few drops of Sriracha. Or mashed into guacamole and scooped up with corn chips. Try this recipe: Mix together thinly cut wedges of tomatoes, chopped onions and green chillies. Add salt. Open a can of sardines in tomato sauce or oil. Mix with tomato salad and enjoy with rice or bread. Canned sardines in oil is even more delicious when eaten with plain bread and pickled chillies . 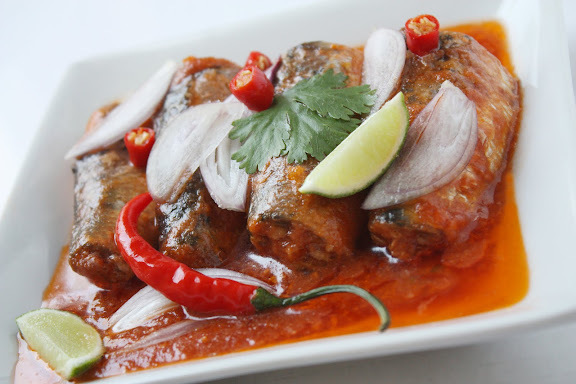 Being brought up in Malaysia, my choice of canned ‘sardines’ in tomato sauce is only limited to ONE thing: Ayam Brand mackerels in tomato sauce. I know, I know, mackerels are not sardines. But ‘sardine’ is always the name we use for any fish in cans, just like people used to call any film rolls Kodak. It used to be the food of necessity for people in remote areas where fresh fish was scarce and during monsoon floods in northeastern Peninsular Malaysia. One of my fond memories is to watch the water rising infront of our house while having plates of rice with sauteed sardines, saltfish, ‘budu’ and omelette. Thank God Ayam Brand graces Asian store shelves virtually everywhere in the world!